Description: CN 4138 GP 9RM CN MacMillan Yard Jan 1st 2006 Note: No Spark Arrestors either. Description: Power meandering about in the yard. Description: This unit was used in the movie The Other Guy and the logo applied is still intact. Description: CN 4138 Paris Junction November 19 2012. Description: This mixed freight changes crew at the east entrance of the Belleville Yard. 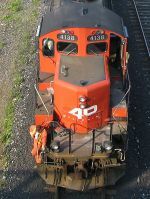 Description: Side view of CN 4138. Description: Cn M331 lead by CN gevo 2229 powers past the London - st. thomas local (L584) after stopping to protect the crossing at Eggerton st. at CN London east!